The 49ers dropped another game by one score late in the fourth quarter after leading before their opponent's final drive. It was the third such game since week six at Green Bay that the 49ers defense has given up the go-ahead score to lose the game after leading. Yet again the defense was the victim of its own mistakes, giving up two big conversions due to coverage miscues as the Giants were driving with fewer than three minutes to play. While the 49ers offense threw two interceptions of its own, the defense failed to cause any turnovers. It was unable to get any pressure on Giants quarterback Eli Manning, racking up just one sack, highlighting the need this off-season to build a solid pass rush. It held rookie sensation Saquon Barkley to under 100 yards rushing (67) but gave up two passing touchdowns to Odell Beckham Jr, highlighting a need the team has to find guys who can cover. Most importantly, the defense gave up two huge pass plays on the Giants' final drive due to coverage miscues that can't really be blamed on the coaching here. It was simply a matter of players not playing their assignments correctly. If coaching has anything to do with it, it's not clearly defining a player's responsibility on a given defensive play call, but there's no way of really knowing if that's true without truly knowing their assignments. Nonetheless, there were some bright spots in the game that we'll look at later, but for now let's start with the miscues on the Giants final drive. The Giants come out in a two-by-two shotgun doubles formation with a simple switch verticals concept called to the offense's right side. On that side they have the tight end inline with the flanker receiver and running back to Manning's right. The receiver to that side runs straight up the numbers while tight end Evan Engram angles out into the flat and then up the sideline. Barkley is running a swing route out of the backfield. The play is designed to flood the open zone in a cover three defense and it did just that. Manning takes the snap and looks to the left to get safety Jimmie Ward (No. 20) to open just enough to that side and keep him from coming back to the verticals. Defensive back Richard Sherman (No. 25) runs with Beckham (No. 13) down the numbers on his vertical route. Barkley swings out and grabs the attention of safety Antone Exum (No. 38) and follows him out to the flat as he has responsibility to play the flat with either the number two or number three receiver in the formation. This leaves linebacker Malcolm Smith (No. 51) to cover the seam or anything that goes vertical from the tight end. Engram angles out slightly and shows a blocking posture on Exum as Exum is running to cover the running back. Smith sees the potential block from Engram and shifts his direction and gaze into the backfield as Engram disengages and turns up field. Smith never anticipates Engram's route and never recovers and Engram runs wide open down the sideline as he catches the pass and gains 31 yards on second-and-10. Later in the drive after a series of penalties by both teams, the Giants faced a second-and-10 again, this time in 49ers territory. They line up in a shotgun far trips right formation with Barkley to the left of Manning. The play call clears out the middle of the field as the 49ers run in man coverage with the trips receivers who run vertical down the field. Cassius Marsh (No. 54) and Malcolm Smith, and this is where it gets tricky, are either supposed to have bracket responsibility on Barkley, meaning one plays outside, one plays inside or high/low, or Smith is supposed to drop into a middle hook near the middle of the field due to Fred Warner's (No. 48) blitz. Barkley runs a "Texas" route out of the backfield and gets a free run into the middle of the field due to the miscommunication in assignments from Marsh and Smith and gains 23 yards. Two plays later, Manning found Sterling Shepard in the end zone for the go ahead score. At this point in the season the defensive miscues should have been addressed and adjustments should have been made. It's also fair to say that adjustments have been made and the scheme has been simplified but players aren't executing because they just don't have the talent on the back end to cover or not make mental mistakes. Either, it will be very telling if this coaching staff doesn't figure out a way to close out games late after having a bye week to sort it out. Earlier this season I wrote about Fred Warner's important role in the defense and why he's been such an integral part of the front seven this season, perhaps the most important piece it has of the 11 out there. Monday night he continued to shine in both the run and pass defense. One of the traits I wrote about in that piece is Warner's ability to constantly keep eyes on the quarterback and the receiver in his zone drops. He doesn't panic when faced with a receiver running through his zone because he's able to shift his positioning and change direction with ease while reading the route concepts. Manning drops back and scans left right away and Warner gives a slight movement toward that direction as Engram runs a vertical route past Warner. Manning likely figured Engram's route would pull Warner more vertical but Warner sees him go vertical and essentially funnels Engram to Exum, who is behind Warner, so there's no need to run with Engram. 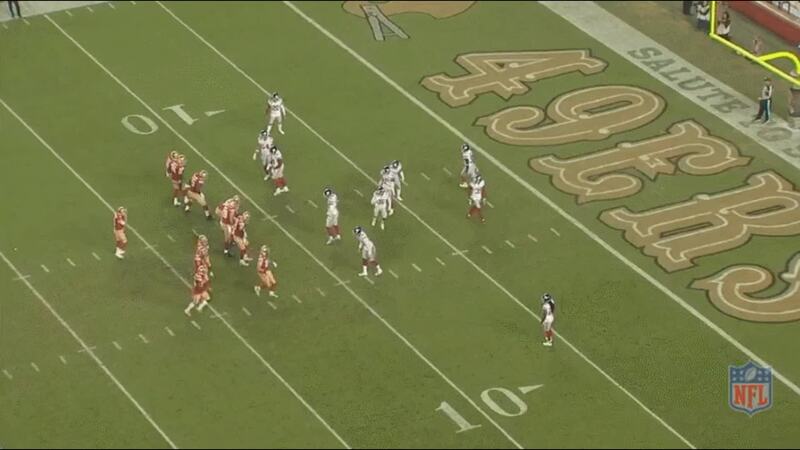 Instead, as Manning shifts his gaze to the right, so does Warner and as sees Beckham running through his low hole zone. He sees Manning running out of time with when and where to throw the pass so he jumps Beckham's route before the ball is even thrown to Beckham. The pass is broken up relatively easily as Warner gets a hand in there to bat it away. On another play late in the game, Warner again broke up a pass intended for Beckham. On a third-and-3 in the fourth quarter, Manning again targeted Beckham running across the shallow middle. Warner and Smith are both in the A-gaps showing a double A-gap pressure before the snap but both drop into middle hook zones at the snap. 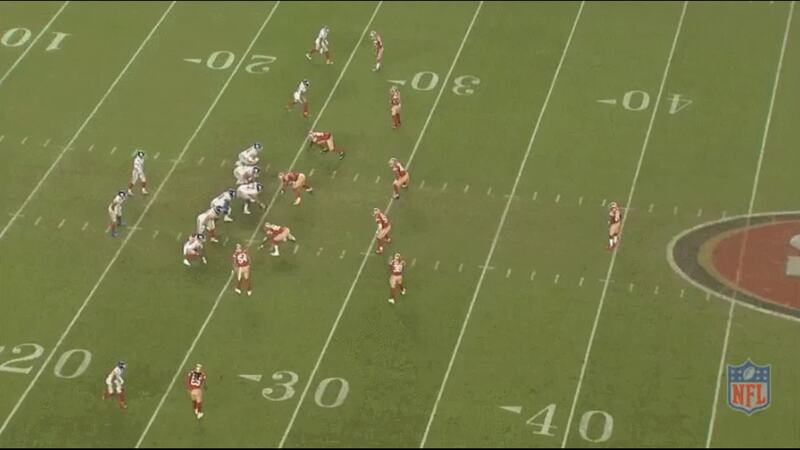 Warner gives a quick glance over to Beckham and sees him on the underneath shallow cross on a "mesh" concept. Warner's instincts allow him to feel when the quarterback is going to make a decision to throw and it allows him to get a good jump on Beckham's route as the pass rush gets to Manning. The rush, consisting of Cassius Marsh and Arik Armstead (No. 91) collapses the right side of the offensive line as DeForest Buckner (No. 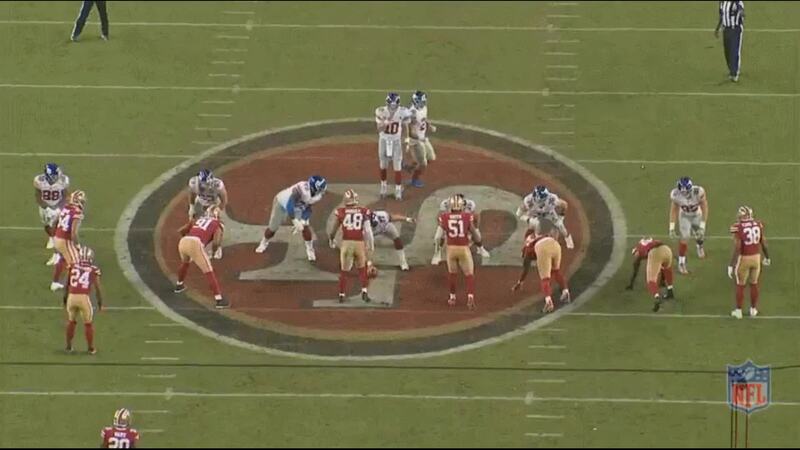 99) comes through the middle and prevents Manning from stepping up to make a throw over the middle. Warner knows Manning has to get it out quick and makes a quick break on the ball as it arrives at Beckham. The pass was a little too far in front of Beckham but Warner still swats it away and ensures Beckham can't convert the first down. Against the run, Warner was just as solid. 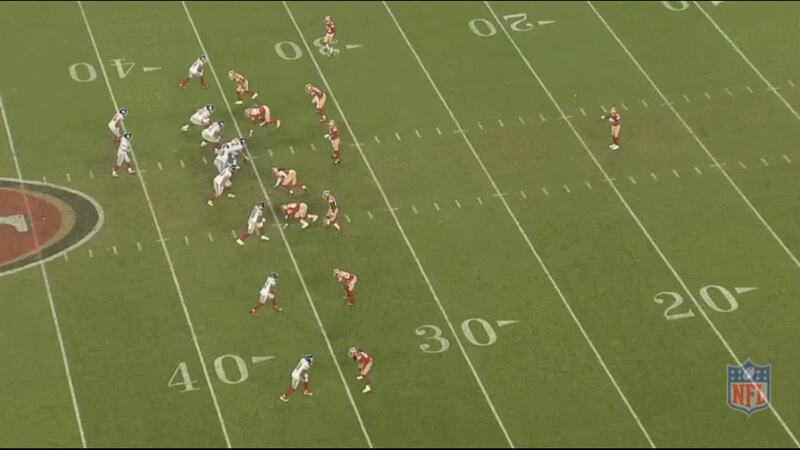 Often times the Giants were able to pick up six or seven yards with the inside zone through the A-gap. 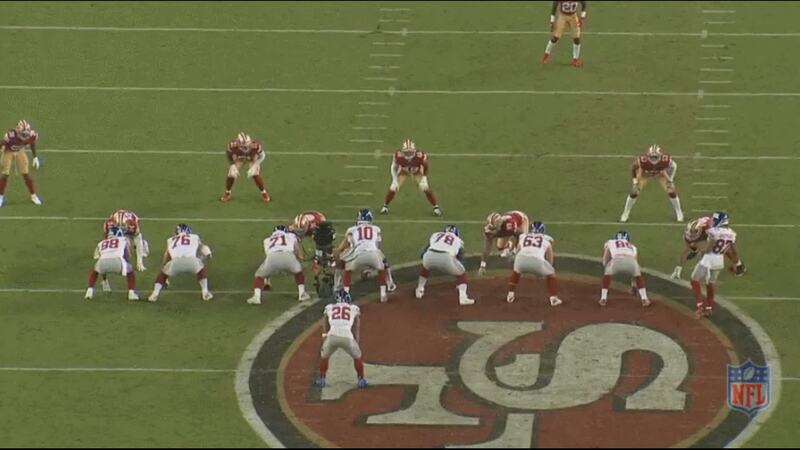 On a third-and-3 from the 49ers three-yard line, the Giants tried to use inside zone again in the A-gap. On the previous play, they picked up six yards to get inside the five yard line through the same inside zone. 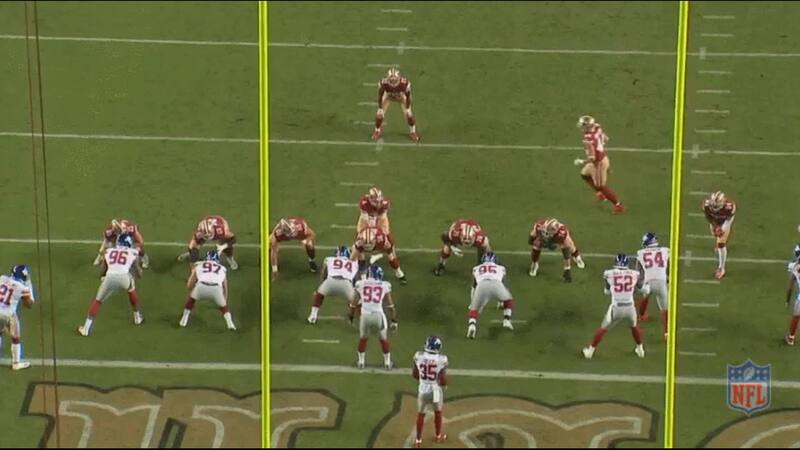 The Giants came back and spread out the 49ers on the next play and motioned Barkley into the back field next Manning. 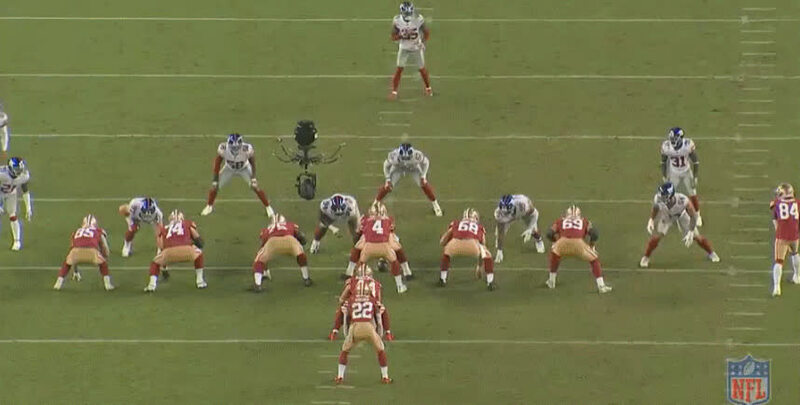 They were looking to take advantage of the 49ers wider defensive front with Marsh outside the line in a wide-9 technique. 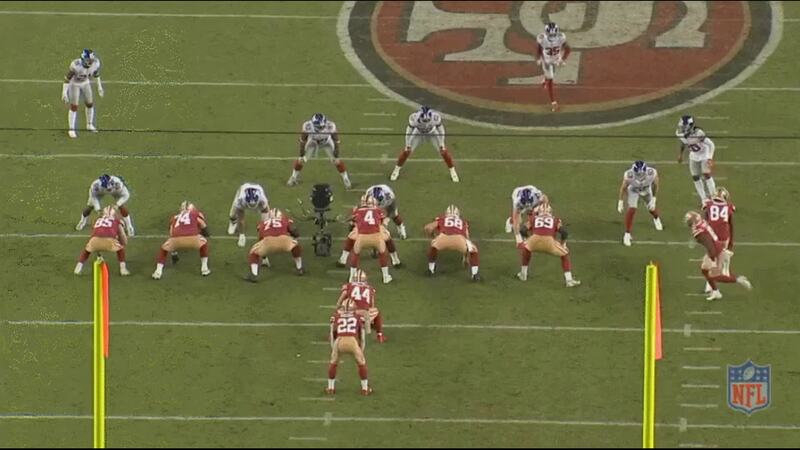 The 49ers had three down linemen and Warner in the middle. 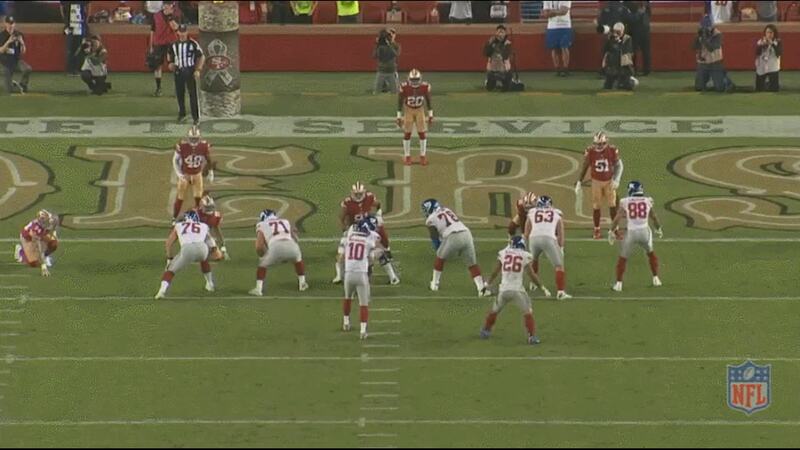 Barkley takes the snap and immediately the 49ers defensive line gets sealed off from the A-gap. The defensive linemen did their part though. Armstead draws the double team as the guard and center slide to reach his back side A-gap rush while and Buckner opens the A-gap by pulling the guard to the offense's left. The A-gap run fit is Warner. Warner shows off his quickness to fill the gap and immediately takes Barkley down after a one yard gain. Not every play needs to be a highlight reel tackle for a loss or pass break-up. What defenders do to alter the timing of play is just as important as making the tackle itself and if you can't make the tackle, your value doesn't necessarily suffer. On this play, although Warner didn't make the tackle, he slowed down the timing of Barkley's run enough that the defense could swarm and take him down for a loss. The play is an outside zone run to the left out of an "ace" or "solo" formation in 12 personnel (one running back, two tight ends, two receivers). Barkley takes the hand-off and as the Giants offensive line executes a double team block at the point of attack on Buckner. Warner recognizes the play right away and uses his speed to burst through the A-gap on the back side of the play as the hole develops. As he sprints through, the lineman disengage their double team block and the guard Jamon Brown (No. 78) slides over to try and block Warner but he's already through the line of scrimmage into the back field. Brown is able to shove Warner just enough to not be able to make the play but Barkley still has to stop his momentum to cut back after Smith had also filled the front side B-gap. Barkley cuts back into the defense and tries to make something out of nothing but Sherman had already come downhill to meet him and tackle him for a loss. If Fred Warner can keep up this sustained level of play throughout the rest of his rookie season, it's safe to say the 49ers have found the anchor to the middle of the defense they've been looking for. Running back Matt Breida has done a nice job stepping into the primary running back role since Jerick McKinnon was lost for the season to an ACL injury. Breida is currently ranked fourth in yards per carry this season at 5.6. That's not bad for the previously undrafted free agent. On Monday night, Breida had 17 carries for 101 yards and one touchdown rushing and three catches for 31 yards and a touchdown. Breida's first run of real significance came at the beginning of the second quarter with his three-yard touchdown run. It was his first significant run since the opening play of the game where he gained eight yards on first-and-10. 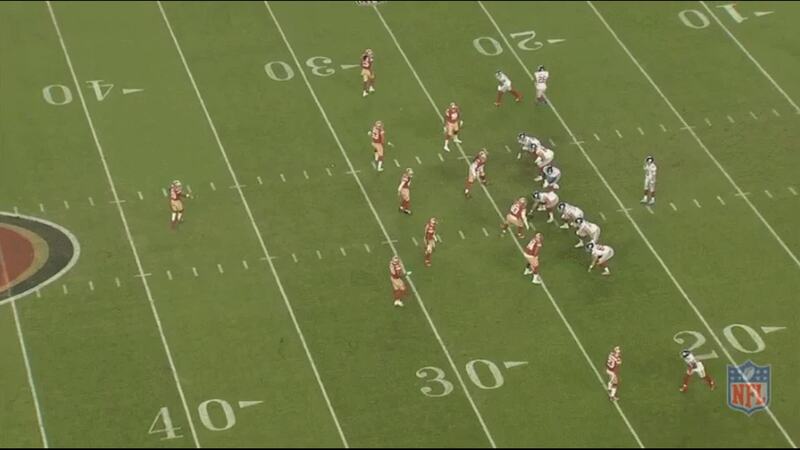 After that point, the 49ers often found themselves behind in the down series until this particular scoring drive. The play shows Breida's ability to get yards after the point at which the offensive line can no longer reliably sustain it's blocking assignments after doing their job. The rest is on Breida to run through defenders and finish the play. They're running a split zone play that hits on the back side of the offensive line with fullback Kyle Juszczyk as the lead blocker who seals off the edge. Split zone is designed to utilize a back side "sift block" to block the back side edge defender. The blocker comes across the formation to kick out the edge defender on the backside to open a running lane. Left tackle Joe Staley blocks down on Giants defensive end BJ Hill (No. 95). That gives Breida a clean edge to follow his fullback to the cutback crease. Juszczyk kicks out linebacker Olivier Vernon (No. 54) to give Breida a crease. Breida makes a nice jump cut in a tight and compact area around the goal line to find the crease. The first defender to contact Breida is safety Curtis Riley (No. 35) and it's at that point Breida should be stopped at about the one yard line and the 49ers face third-and-goal. Instead, Breida lowers his center of gravity and runs right through the tackle attempt. The next defender to contact him is too late as he's already across the goal line. The play highlights his quick short bursts and vision in tight spaces. It is undeniable that the 49ers offensive line is good, perhaps borderline elite in the running game. It regularly opens creases and running lanes for its running backs but there is a burst of offensive output when Breida is in running the ball versus when Alfred Morris is in. The tempo of the play looks faster and the running game isn't as limited with the smaller, shiftier Breida. That quickness and agility was also on display on several runs as he made quick cuts and caused defenders to miss their tackles. This longer run in the fourth quarter showed all these elements. The 49ers favorite running play the last several weeks is the wide zone with a fullback lead. It looks like a toss play but it's designed to hit quicker and take advantage of Breida's quickness and vision. It's also blocked like the outside zone. Laken Tomlinson (No. 75) and Weston Richburg (No. 58) scoop and reach block the interior of the defensive line, pinning them to the inside while Staley and George Kittle (No. 85) kick out the end men on the line of scrimmage, opening a lane for Juszczyk to lead block through. Breida sets up his blocker by giving a slight inside move, allowing Juszczyk to pin the defender inside as Breida cuts up between him and Staley. As Breida cuts through the line, he encounters Riley again and at this point the play should end. But he makes Riley miss again and instead gains 23. These next two runs show his ability to make defenders miss and his ability to cut quickly when it looks like there is no room to do so. The first play is a toss crack play that the right guard Mike Person (No. 68) was never able to get on the edge to block. And receiver Kendrick Bourne never crack blocks the edge defender. Doesn't matter to Breida. He cuts on a dime when he sees a small enough crease he can wriggle through as the defensive front can't stop and change direction as quick as Breida did. On this next play, Breida makes 2 defenders miss in the backfield as they try to grab him up high before he even hits the running lane. Breida's power and balance allow him to re-center himself quickly before he accelerates, never breaking stride, past the next potential tackler. That gets him through the hole and down one yard short of a first down. Four plays later he would a receiving touchdown after catching a pass that was a bit high from Mullens but put in the only spot Breida would have a chance to catch it, showing off superior body control while running full speed. He's not typically known for being a receiving back but made a couple of nice catches that might make Shanahan reconsider his usage in the passing game downfield. It is frustrating to watch this team lose so many close games within one score and even more so when it gives away a late lead on the game's final drive. But there are encouraging signs in several phases of the game that should keep fans at least somewhat hopeful for their prospects going forward. The miscues need to be cleaned up on defense but Fred Warner is playing a fourth year veteran level with his understanding of the game around him. And the offense for the most part is moving the ball well with a practice squad quarterback and an undrafted free agent running back.